Fun card games are first and foremost, easy to play. There are literally hundreds of them, plus they're typically easy to learn and a blast to play. In this article, I have narrowed down my favorite four fun card games that are played in North America. (I did not include all the types of Poker, as there are too many to get into. 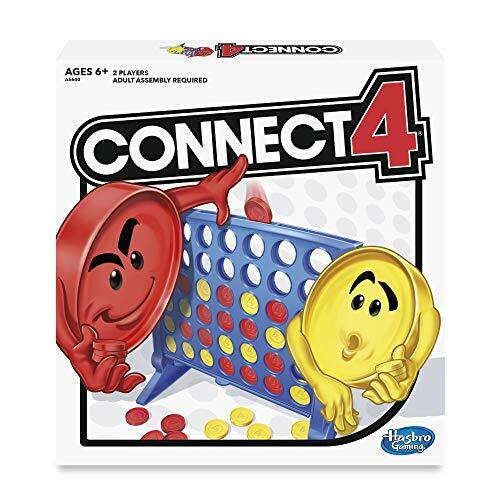 This is another one of the most popular North American card games and is fun for the whole family. The best part? It is easy to learn and a whole lot of fun! This game involves tricks, trickery, and trying not to get the queen of spades! Each player gets dealt 13 cards but only if there are four people playing. If it is just three players remove the 2 of clubs and deal 17 cards to everyone playing. Next, all the players look at their hands and see what they have, they then pass three cards to another player (typically to the left, but whatever way your table wants, it doesn’t matter). When you get handed three cards you must keep them. Next, the person to the left of the dealer will “start” the game. Every player plays one card in the middle, and whatever suit is first played the other players must follow. If they don’t have a card of that suit, they can throw away any other card. Whoever has the highest card of the lead suit takes the point, and in Hearts we call that a “trick”! So why is the game called Hearts? Well, because that suit plays a unique role in this game. Whenever you take a trick, all the hearts in your hand are worth one point. The goal is to end up with the least number of points as possible at the end of the game. There is only one other card that is worth any points and that is the devilish queen of spades, which is worth 13 points by itself, and you want to get rid of it as fast as possible! Now to start playing hearts, a heart must previously have been played when another suit had been lead. This is called “the hearts have been broken.” After every single hand, count the number of points everyone has and write it down. Once someone reaches 100 points, the game is over and the person with the least number of points is the winner! One other thing to note is something called “Shooting the Moon.” Many people play with this added to the game and it can be a lot of fun but is quite hard. 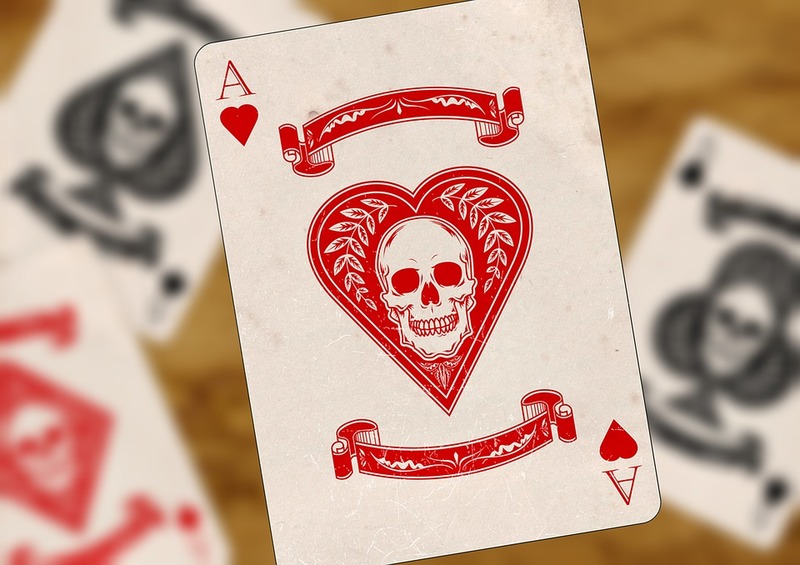 If you get every single heart in the deck (13 in total) and also the queen of spades, you get to “shoot the moon.” What this entails is you can either take away 26 points from your total or give 26 points to every other player in the game. This can make you win a lot easier, but it is also risky if you don’t get every single one. This is an incredibly popular game in North America and all over the world, and it happens to be one of my favorites. My grandmother, who just turned 101, taught me this game as a young boy and I have played for hours and hours throughout my life. Let me quickly warn you that while this may sound confusing, as soon as you start playing, it gets a lot easier! All players sit around a table and the teammates sit opposite each other. Five cards are then given to each player. Afterwards, the dealer takes the next card in the deck and turns it up on the table so everyone can see it. Now, the players decide what the “trump” suit will be. Trump means the “most powerful suit” for this “trick.” It all begins to the left of the dealer. The person either orders the dealer to pick up the card, which means that suit is trump, or they can pass. If they pass, it goes to the next person. If it makes it back to whoever dealt, they have the option of picking up the card or passing as well. If they pass, they do not pick up the card. Then it passes to the person to the left of the dealer and they can decide what they want trump to be (it cannot be the suit that was just passed on). If no one calls a trump, the dealer must decide what is trump. Trump always wins. If the trump is hearts, and the highest card played is the ace of spades, even the 9 of hearts will beat it! Once trump is called, whoever is to the left of the dealer plays the first card. 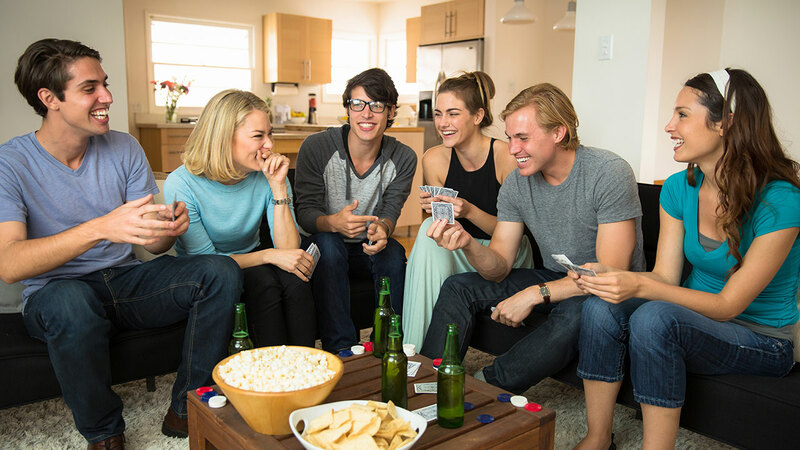 Each player then plays a card, and whoever plays the highest card (out of the four) wins that “trick.” Whatever card is played first, all the players must follow that suit. However, if you don’t have a card of that suit, you can play whatever you want. 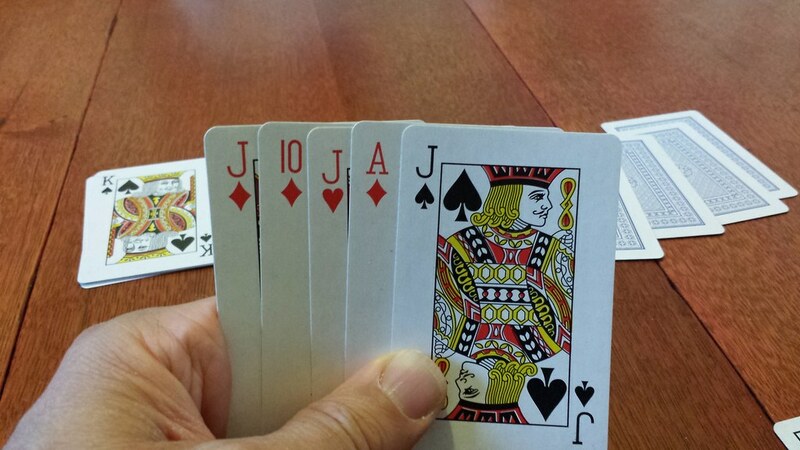 This continues until all five hands have been played. There is one other thing to note. When you are figuring out trump, anyone can say they are going “alone;” this means without the help of your other player. People usually call this when they at least have both the left and right bower in their hand. If you win all the tricks by going alone, you get four points. It can be risky but very rewarding. First deal 5 cards to everyone playing. If it is only 2 people, deal 7 cards to each player. Once the dealer has done that, they can place all the rest of the cards face down in a pile in the middle of the table. Now you can turn the top card face up and the game has started. The player to the left of the dealer starts and they can either play a card that matches the suit of the card that has been faced up, or pick up another card from the pile. If they have a card that matches the number of the card faced up, they can play that. For example, if you the card on the table is 6 of diamonds, you can play any diamond card or any card with a six on it of a different suit. The reason it is called crazy 8s is because 8s are wild and can be used on any card, at any time. When you play an 8, you can now call out any suit that you want the 8 to represent. The next player now must play a card of that suit! The first player who gets rid of all their cards is declared the winner of the game. To make the game more challenging and a lot more fun you can add new rules. Generally, people make any “4” played reverse the order of who goes next. If any king is played, the next player loses their turn. My favorite rule to add is “Pick Up 2.” If a 2 is played, the next player must pick up 2 cards. You can make things really crazy by making all these add up; if a player puts a 2 on top of a 2, the next player has to pick up 4 and so on and so forth! Things can get really crazy and I once had to pick up 16 cards! This makes the game go longer and is a lot of fun! 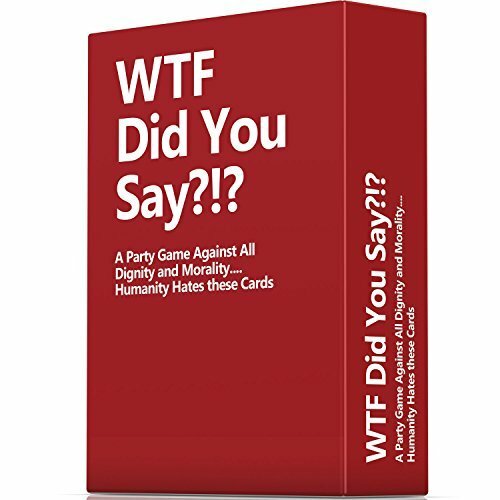 This is one of the most popular and fun card games in North America. Everyone has heard about it, but a lot of people don’t know how to play it! 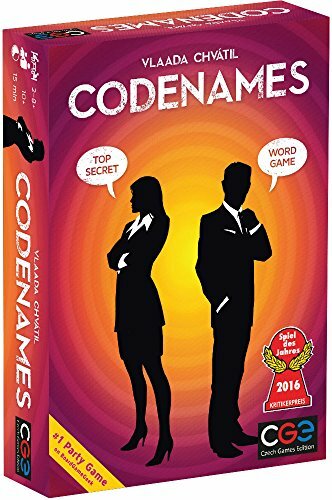 It is a great party game and something you should learn if you want to go to any casino. Free download from SuperLucky Casino! Someone at the table must choose to be the dealer for every hand, as the dealer is really important. Everyone else can now be considered a player. The dealer deals one card face down to everyone, including him- or herself. Then, everyone is dealt one card face up, to the right of the face down card. The player is not allowed to look at their card face down. The main goal is that you do not go over 21 in your hand. If you look down and you see a 2 face up, the chances are your hand does not equal 21. So now you say, “Hit ne.” If you say, “Hit Me” to the dealer, they will deal you one card face up. The main goal of the game is to always beat the dealer, as they will play as well. You want to get closest to 21 without going over. If the dealer goes over, everyone else at the table wins. If you are just playing casually, make it a competition between everyone as it is just more fun. 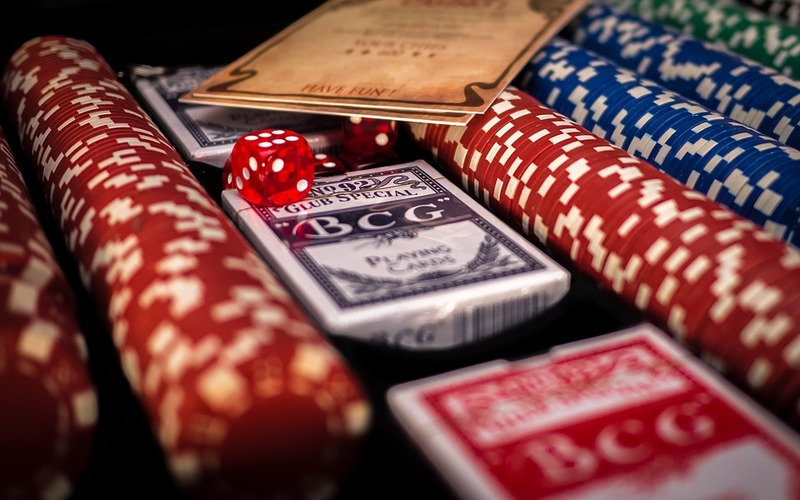 You can either play blackjack with or without gambling, it is a fun card game no matter what! When I was a kid I played with potato chips and it was a whole lot of fun! I hope my guide to the top four most fun card games in North America has taught you how to play them. Card games can be great fun and I find them a fantastic alternative to video games. 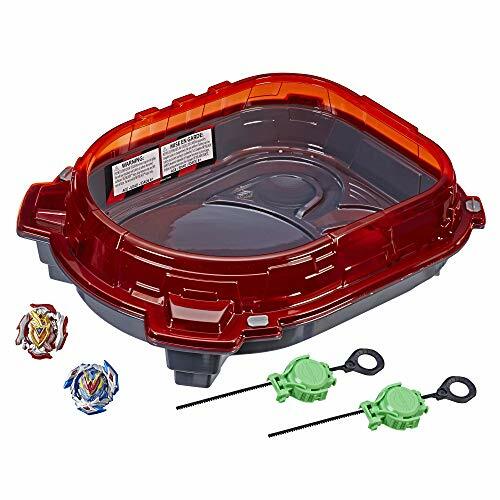 I hope card games do not fall by the wayside. There are so many other card games that I did not have time to get to today. A simple Google search will shed light on any game and set of rules you need to know!